Given a two‐digit number, mentally find 10 more or 10 less than the number, without having to count; explain the reasoning used. 1.NBT.C.5. Students should be able to count by 10s to 100. Practicing this could be part of the morning routine. Students should be familiar with the Hundreds Chart. 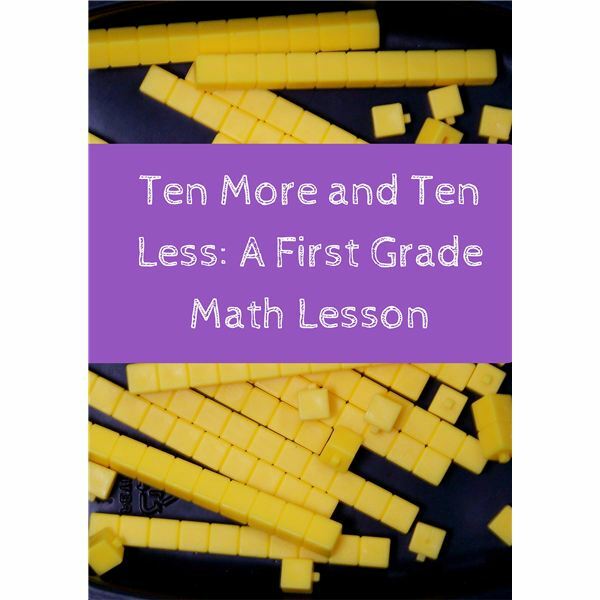 Students should be familiar with using Base Ten blocks. Provide base ten blocks to each student or pair of students. Write the number 35 on the board. Then say, “Show the number 35 with your blocks (three tens and five ones). Now add one more 10 block. How many do you have now?" Write the number 45 on the board under the number 35. What happens when we add another ten block? We have 55. The 4 changed to a 5. So we had the numbers 35, 45, 55. Each time we added 10." Give each student a hundreds chart. Say, “Put your finger on the number 10. Let’s count by 10s and point to the number as we say it. 10, 20, 30, 40….to 100. Each time we moved down one row and we didn’t need to count." Continue with, “We know how to count by 10s. We are adding 10 each time without having to count. Now find the number 35. How will we add 10 without counting?" “Now find the number 92. Let’s take away 10 each time. Without counting, what is an easy way to do this with the hundreds chart?" Now it’s time to put rhythm into counting forwards or backwards. Students should be standing and clapping as they count. Choose a number. Let’s say it is 22. Then ask the kids to count and clap as you add 10. 22,32,42,52… Do this every day with a different number. Add 10 or take away 10. A variation of Duck, Duck, Goose! Instead of the student who is “It" saying duck, duck, duck and then choosing a Goose, give the student a starting number and that student has to add or subtract 10 as he taps heads while going around the circle. The “Goose" will be the last possible number. If adding it will be in the 90s and if subtracting it will be in the single digits.